​​Over the next five years, Delta plans to hire more than 25,000 new employees, which include high-skilled, high-paying jobs. 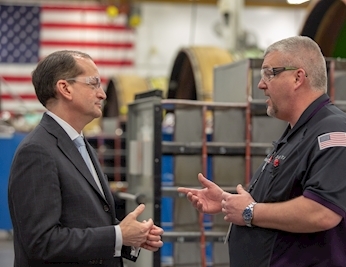 This news prompted U.S. Secretary of L​abor Alexander Acosta to visit Delta this week to learn more about the airline's workforce development programs and to tout the great job Delta is doing to prepare for the future. More than 30 percent of aviation maintenance technicians at Delta will be eligible for retirement during the next decade. That's about 2,000 technicians. As part of its commitment to educate future aviation professionals, Delta has joined forces with over 40 aviation maintenance training programs across 21 states to help identify and mentor the next generation of AMTs. Through these partnerships, Delta offers tours, job shadows, and career guidance for these schools as well as training opportunities for instructors. Where possible, Delta donates serviceable parts, engines and airframes to give students even more real-world maintenance experience working with jet aircraft components. The Secretary also made a stop to at Delta Flight Ops to learn about the groundbreaking Propel Pilot Career Path Program, which aims to identify, select and develop the next generation of pilots. The Propel program launched last summer. Members of the Propel team shared how this industry-leading program complements the traditional, existing paths to becoming a Delta pilot and has three main areas of focus — college, company and community. “As we look forward to this coming year and beyond we’re seeing an incredibly strong economy. We have more open jobs than we have individuals looking for jobs, which highlights the importance of workforce development,” said Secretary Acosta. 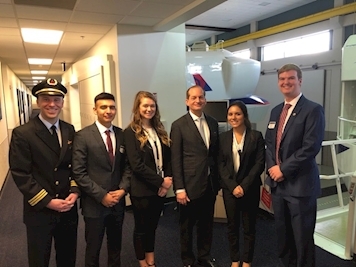 “Delta explained that their Propel program identifies young men and women who want a career in aviation and gives them an opportunity to not only learn while they are in school, but to earn money going forward,” said Secretary Acosta. "We are so proud of the Propel program and the students who have entered the first two classes," said Captain Patrick Burns, Managing Director — Flight Operations and Chief Pilot. "During the next decade, Delta expects to hire more than 8,000 pilots to staff the thousands of daily flights it operates around the world as other pilots approach mandatory retirement age." Secretary Acosta wrapped up his Delta tour by 'flying' one of Delta's Boeing 777 simulators with Propel pilot Paige Thompson and intern Megan Brown.